I am of the opinions any kind of creative work usually takes a life of its own eventually. In the last two years this blog has managed to discover its own rythm and a unique identity distinct from its parent Lucifer House Inc., which itself faced with a mid-life crisis is currently undergoing some deep soul searching. Original fiction work series running over 2-3 months alternate with appreciation of existing works. I somehow prefer the term appreciation over the term review as review has an element of judgement to it and I don’t feel competent to judge my betters. Most of the works I cover here will be works that have already proved their merit beyond doubt and I shall only be playing the role of a fan boy sharing my love for the works with a wider audience still not initiated into these lovely worlds. So having concluded a series of original fiction with the theme of unique points of view, we now move on to some showcasing of popular works. This time we will take on the most popular medium – movies. I am going to talk about some of my favorite science fiction, fantasy and historic movies of all time over the next few weeks. I am also planning a few changes in the blog – most of my original fiction shall henceforth be available to read only for a limited period of time. After that I plan to take them down and polish them to compile into short story collections. While I am still not dependent on my writing for a living and would be glad to offer my stories for free on my blog, I feel blog posts come with an expiry period. People rarely read old blog posts. So I decided after having put creative effort into conceptualizing a story, it is pointless to let it languish on blog archives. So from now on, only one fiction series will be available on the blog at one point of time. The moment the next one starts the previous one will go offline. The other thing I am going to do is to broaden the scope to bring a wider readership. 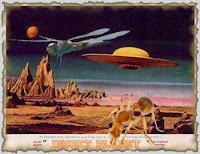 The idea of this blog was to introduce people to the fascinating world of science fiction, fantasy and historic fiction. But calling it a blog on science fiction and fantasy does not serve that purpose as it puts a label on the blog right away and makes it kind of a restricted area. So I plan to broaden the scope and talk about the past, the plausible future and wild imagination in general rather than just the works of fiction associated with these realms of the mind. So going ahead one can expect to see themes of a more general interest that might provoke interest in the related fiction genres in quite a few. In line with these changes, I shall have to redesign my blog and change the tag line as well. I shall be doing that when I get some free time later this year. I am also aware a blog needs a good header like a book needs a cover illustration. It has been pending for long and hopefully I would have one up very soon.